From many countries we have received various evaluations of our ways of dealing with this massive disaster, both positive and negative. It is certainly a ‘natural calamity’. The massive earthquake was caused by the great destruction of the vast area (about five hundred kilometers from north to south, and about two hundred kilometers from east to west) on the bottom of the sea. The epicenter is where the Pacific Plate and the Eurasian Plate confront with each other, and the Plates moved, slid and warped in about six minutes. This movement has given us these great hardships in history. The whole Japan especially the people in the disaster stricken areas have been thrown into terrible, horrible condition. I can not find any words to those who were hit by this traumatic disaster. According to this article, in the year of 896 (Heian era), Jokan Earthquake estimated M. 8. 3 hit the area and more than a thousand people were killed by tsunami. In order to know how big the destructive power of M.9.0 is, we AINOKI Church retrieved the past data and others, and were amazed by the fact that it is 487 megaton! To understand how powerful this figure is, we have compared it with the explosive power of two A-bombs on Japan and of the accident at Chernobyl’. All yields (explosive power) are given in their estimated energy equivalents in kilotons (1 kt is 1000 ton) or megatons (1 Mt is 1000 kt) of TNT (trinitrotoluene). The yield of A-bomb Little Boy of Hiroshima is 15 kt. The yield of A-bomb Fat Man of Nagasaki is 21 kt. 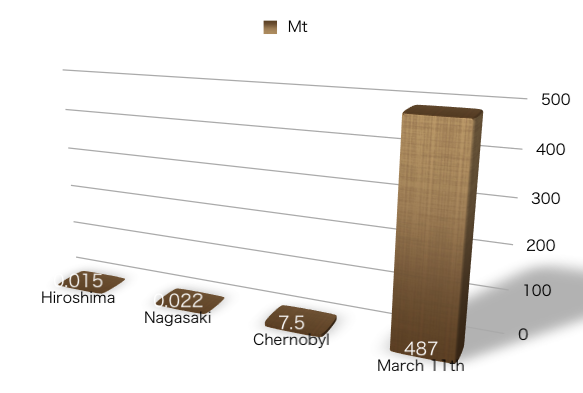 The accident of Nuclear Power Plant in Chernobyl’ is 7.5 Mt. And as above-mentioned, destructive power of massive earthquake M.9.0 is 487 Mt. We are just amazed by the great destructive power of this quake, it is far beyond our imagination. Later we will put a list of milestone nuclear test explosions. 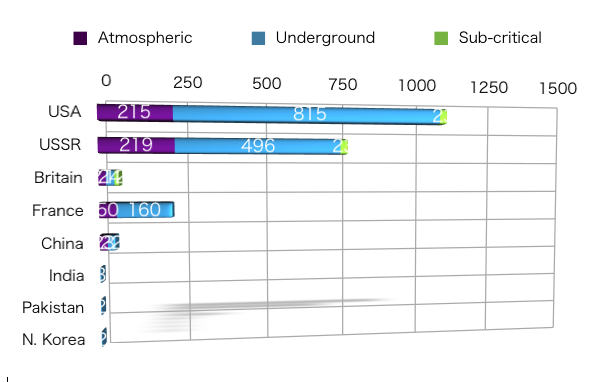 As of May 2005, the nuclear powers had conducted test explosions at least 2100 times (only acknowledged ones). These atomic underground tests ought to have affected the earth adversely. No wonder we have been worried inwardly for many years. We have contaminated the earth with toxic substances and made enormous holes inside the earth. There is a great possibility that the earth’s axis goes wrong. Great scholars or experts must look down on and may not accept lay opinions, and yet we cannot ignore our instinct of self-preservation and intuitive power of living creatures on the earth..
Can we assert that this traumatic great disaster has nothing to do with the nuclear test explosions that the nuclear powers conducted so many times? Is it just a persecution complex to think that the actions of us stupid humans having harmed the troughs on the bottom of the sea have induced the Plates’ slid and warp? According to the opinion poll done by mass media after this disaster, those who were for nuclear electric power generation exceeded those who were against it. They prefer convenient daily lives! “Nuclear power generation is clean and safe” came out to be fake and collapsed miserably. I think it likely that the era of consuming electric and other energy endlessly will come to a stop. Japan was atom-bombed twice on Hiroshima and Nagasaki, and yet has depended on the perilous nuclear electric energy just for convenience. I am deeply worried that if we continue such contradictory way of living, someday we might face the same kind of great danger again. To change the subject a little, I have tried to convert the yields into quantity of gasoline tankers. Please forgive me if my calculation is not correct, because the figure is astronomical for me to handle easily, but I hope it would help you to know the power more precisely. Tank lorries now head for the stricken areas carry 2000 to 5000 liters. I used 5000 liters in calculation. A heat value of 1 ton of TNT is equal to that of 150,000 liters of gasoline. The explosive power of A-bomb of Hiroshima is equivalent to that of 2,250,000,000 liters of gasoline. That is if we pour down the whole gasoline in 450,000 tank lorries on the ground and set it on fire at a time, we can get the same heat value! The March11 earthquake→7,305,000,000,000 liters and 14,610,000,000 tank lorries. It is our responsibility to hand down safe and clean natural environment from generation to generation. All yields (explosive power) are given in its estimated energy equivalents in kilotons (1 kt is 1000 ton) or megatons (1 Mt is 1000 kt) of TNT (trinitrotoluene). 1945-08-06: Little Boy ①15kt ②USA ③Bombing of Hiroshima, Japan, first use of a nuclear device in military combat. 1945-08-09: Fat Man ①21kt ②USA ③Bombing of Nagasaki, Japan, the last use of a nuclear device in military combat. 1946-07-01: Test Able ①23kt ②USA　/ 1946-07-25: Test Baker ①23kt ②USA ③Bikini Atoll; The crossroads tests to investigate the effect of nuclear weapons on naval ships. 1951-05-09: Test George　①225kt ②USA ③“George” shot was physics experiment　relating to the hydrogen bomb. 1958- :Operation HardtackⅠ　①35.6 M ②USA ③A deep underwater explosion. First live nuclear bomb launched by a missile. The nuclear device was detonated at depth of 500 ft (150 m) in deep water. The yield of the accident at Chernobyl’ Nuclear Power Plant is 7.5Mt, and is 500 times more powerful as the A-bomb of Hiroshima. And that of the M9.0 earthquake is 487Mt.